Near the top of my list is sweet home Chicago—a mesmerizing metropolis, once home to generations of Illini, Winnebago, and Miami peoples, rising along the shore of that immense inland sea and sweeping toward the dazzling prairie just beyond. There’s Upton Sinclair’s The Jungle and Sandra Cisneros’s The House on Mango Street, Saul Bellow’s The Adventures of Augie March, and Richard Wright’s Native Son. There’s Nelson Algren’s The Man with the Golden Arm and Studs Terkel’s Division Street, Gwendolyn Brooks’s Maud Martha and Lorraine Hansberry’s A Raisin in the Sun. So great, and there’s more: Haki Madhubuti, Kevin Coval, Eve Ewing, and Chance the Rapper, Chris Ware, and Aleksandar Hemon, the Wachowski siblings, Muddy Waters, and Howlin’ Wolf, Koko Taylor, and Yoko Noge, Lil Hardin, Bo Diddley, Jimmy McPartland, and the Sun Ra Arkestra. On and on. 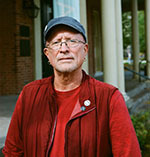 William Ayers, GSE ’87, Distinguished Professor of Education and Senior University Scholar (retired) at the University of Illinois at Chicago (UIC) has written extensively about social justice and democracy, education, and teaching as an essentially intellectual, ethical, and political enterprise. His books include A Kind and Just Parent; Teaching Toward Freedom; Fugitive Days; Public Enemy; On the Side of the Child; To Teach: The Journey, in Comics; and Demand the Impossible!